Spring training coverage starts next week, but I got over to the Complex a little earlier today. The feature picture is Don’s merchandise store, a spring training fixture at the Complex and later outside the west gate at Bright House Field (Spectrum Field when they finally change signage). When I got to the Complex, the pitchers were long tossing in left field on Roberts Field. There looked to be 25-30 pitchers there. Position players were doing the same in right field on Carlton Field. The position players were easier to watch and identify, so I have a lot more info on them. Three more players were on hand today – Nick Williams, Rhys Hoskins, and FA signee Hector Gomez. Several pitchers threw off the mounds behind the Complex (the Seven Mounds). We couldn’t see who was throwing, but all the catchers suited up to receive – Jorge Alfaro, Andres Blanco (yes, he’s the Phillies’ emergency catcher), Chace Numata, Austin Bossart, and Greg Brodzinski. Meanwhile, the coaches worked out 4 guys at first base – Tommy Joseph, Rhys Hoskins, Caleb Eldridge, and Gomez. Larry Bowa was hitting, so they weren’t hit very hard (haha!). Threshers’ manager Shaun Williams took throws on plays to second base. Coach Rob Ducey hit balls to Andrew Pullin in left field. I paid closer attention to BP. Around the cage (L to R) – Blanco’s right sleeve, Roly pitching, Pullin’s back (see how big shoulder to shoulder), Alfaro with bat, Williams at bat, Bowa with the skinny pale legs, Stairs, Numata’s arm in red, Bossart in gray, Eldridge’s head, and Brodzinski in black. Quinn hit a lot more line drives right-handed than left-handed. The ball sounded different coming off Joseph’s bat. In a good way. Like he’s hitting the sweet spot more often than others. Too early to comment on Hoskins and Williams, they just arrived. But, Hoskins looks bigger than I remember. I didn’t try to identify the pitchers as they left Roberts Field, they weren’t close enough and few had their names on their shirts. But a few who finished later or had unique characteristics were noticeable – Mark Appel (he was pointed out by Steve Potter), Kyle Young (he’s tall, I could identify him from 100 yards), Jesse Beal (I just met him and he’s fresh in my mind), and Trevor Bettencourt (he had his name on his T-shirt). 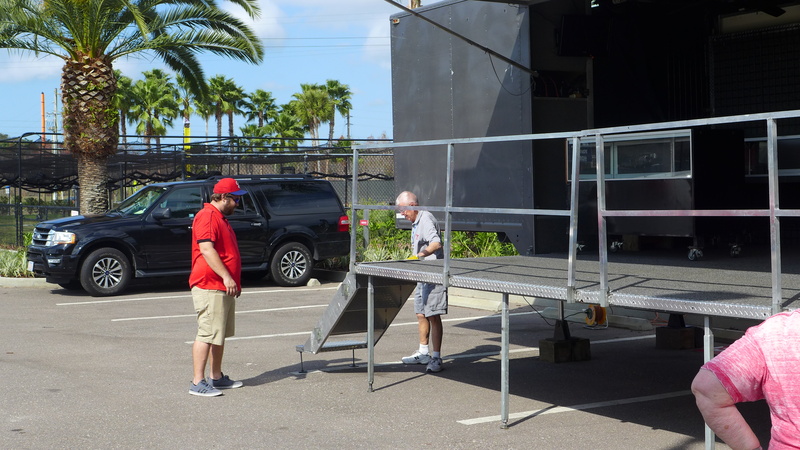 A sure sign that spring is upon us, Don Guckian getting the store installed for spring training. Altherr swinging from the left side, I guess he is just goofing around. Romus, he’s another guy I haven’t closed the book on. Yes he probably won’t be a front line player but his athleticism lends to making a significant contribution as what you might call a “limited” 5 tool player. Ok, maybe just 4 tools since he’ll likely not hit for avg. And if so, that would make him valuable to another club as well. 8mark…….there at a few too many players like Altherr around baseball. Phillies, in Goeddel, appear to have another. However, you are correct…he is a four tool player, but just too much swing and miss..
IMO, Altherr’s value is probably intrinsic only with the Phillies and not sure he would bring back much in value in a trade.. According to Roster Resource, Altherr has one option remaining. Other Phillies with options include – Herrera (3), Franco (2), Joseph (2), Rupp (1), Goeddel (3), Nola (3), Velasquez (2), Eickhoff (2), Neris (1), J. Rodriguez (1), Ramos (2), L. Garcia (1), Alfaro (1), Quinn (2), Asher (2), and Morgan (1). My bad. My notes weren’t clear. The batter is Nick Williams. We all need spring training. Great stuff Jim. I’m over in Palm Beach for the month. I’m going to visit Jupiter for a day in two weeks to see the Cardinals and the Marlins and then a day to see the Nationals and the Astros. Two days and 4 teams. Should be interesting. Please explain to me how Alfaro has only one more option remaining. I’m in WPB for five months and I live less than two miles from the new Astros-Nats complex. The Astros just bought a business complex that is 5-6 stories which they are converting into a hotel to house their players and fans. The Phils never come over. The only time they came (while I was down here) was after the ’08 championship year. Murray, how far do you live away from the WPB complex? Options are not based on the number of call ups within a year. A player can be on the 40 and be called up and sent down numerous times within that championships season…..he only uses one option. Third and last option was Nov 2016 for this season.